Through the years we've all heard the legends of Ted Williams' dedication to hitting, the part of the game he single-handedly elevated to high art. When it came to his fielding however, we're so often told he was indifferent or even below average. The truth, which comes from his teammates and guys he played against, is much different. Despite his slender frame, Williams wasn't a speedster, which perhaps hampered his range a bit, but, like his hitting, Ted worked hard to improve his skills. He took his place in left field for batting practice every day, striving to catch everything hit in his direction. He mastered the tricky angles of The Wall so well that opposing batters knew not to try for an extra base if they managed to hit it. Applying the same encyclopedic knowledge he had of opposing pitchers, Williams did the same for the Boston pitchers, anticipating how and where a ball would be hit off them. According to teammate Boo Ferriss, Williams even used a bit of trickery to gain the edge: "he used to fake catches with runners on base - make the runner think he was going to catch the ball. He'd be on the warning track, leaning against The Wall, popping his hand in his glove. That would hold the runner up." 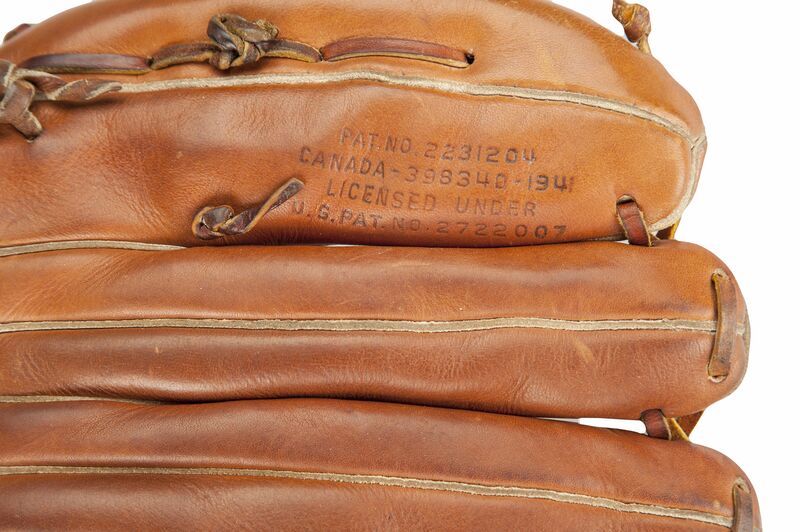 This stunning piece of baseball history dates from Williams' final season, 1960. 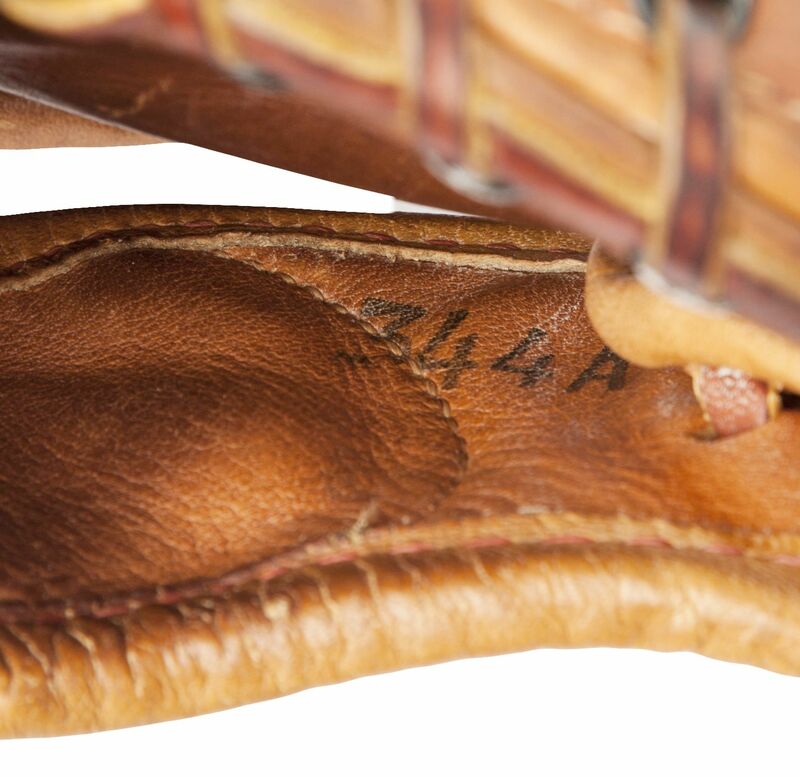 The Wilson 11 3/4" "Shooting Star Palm" fielder's glove shows the "344A" pro code under the wrist strap which confirms this glove was manufactured specifically for Williams himself. 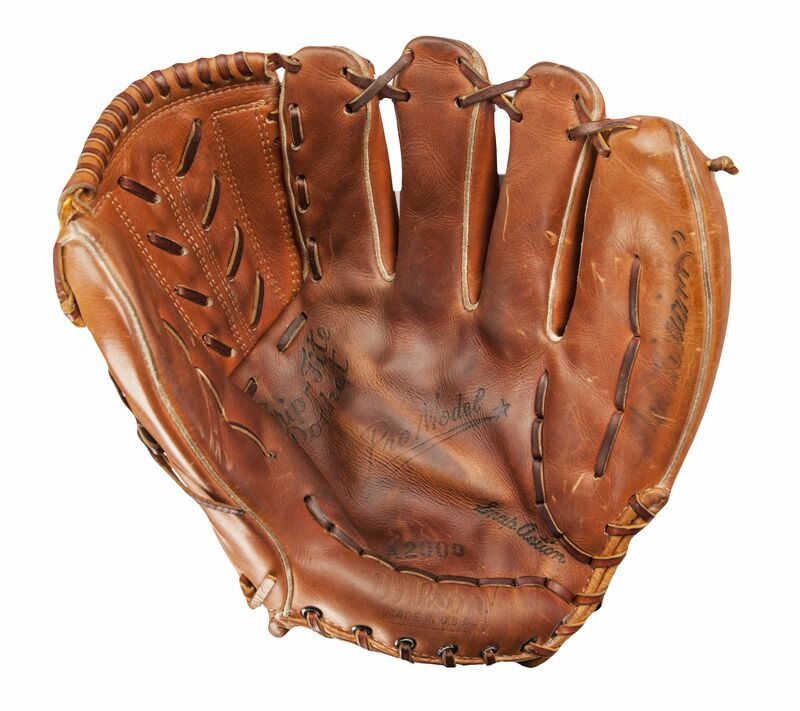 Made from premium Chicago leather, it boasts a Solid X-Lace Web, a new innovation at the time, making this style of glove closer to the modern version in use today than the ones available at the beginning of Williams' career - a silent demonstration of how his long career spanned two distinct eras of the game. 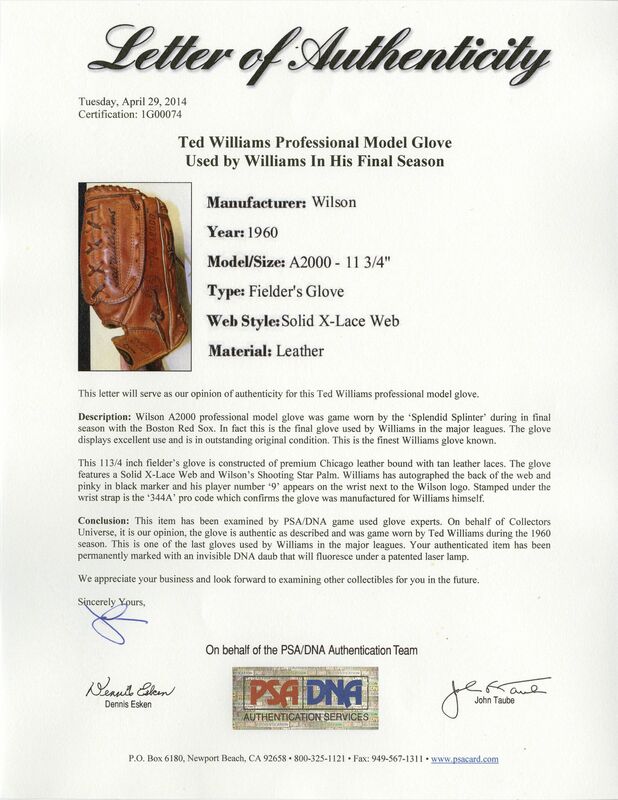 The glove shows excellent game use, the palm darkened and broken it from genuine wear by Williams. The inside of the fingers have the right amount of darkening, scuffs and wear you want in a glove used for a Major League season. The tan leather laces are intact and though slightly worn, the woven Wilson "W" logo is still clear and present on the back of the wrist strap. 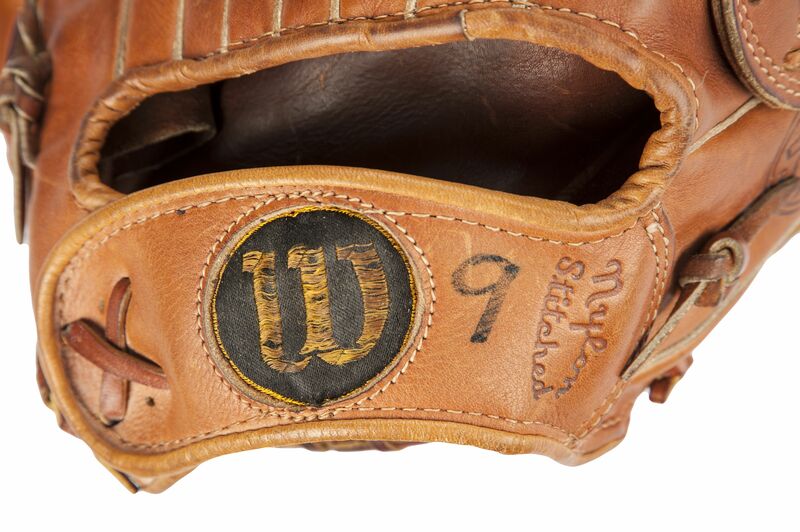 Remarkably, the leather still remains supple and pliable, almost as if Number 9 himself had just taken it off after an afternoon game at Fenway in 1960 and put it down in front of you - it even still smells fresh. Next to the "W" handwritten in black marker is the great man's immortal "9". 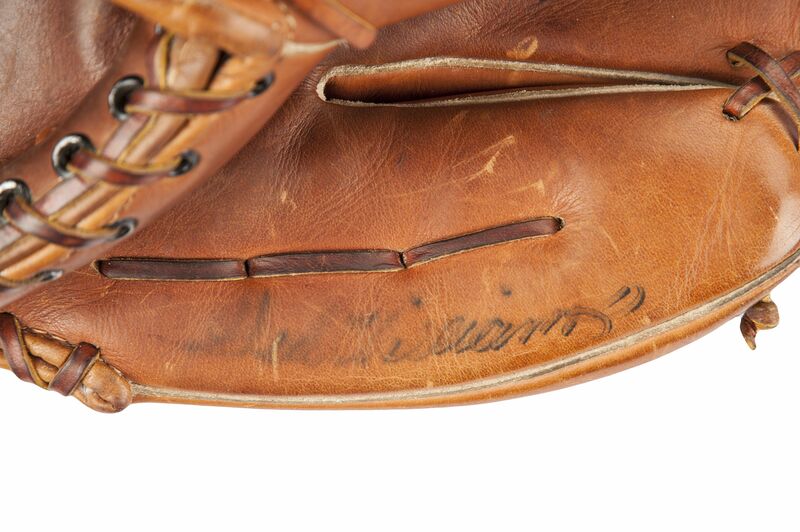 As if a game used Ted Williams glove isn't enough, the Hall of Famer has signed the glove twice in black marker - once on the inside of the pinky finger which has partially worn away over time and again boldly and complete on the outside of the Solid X-Lace Web. 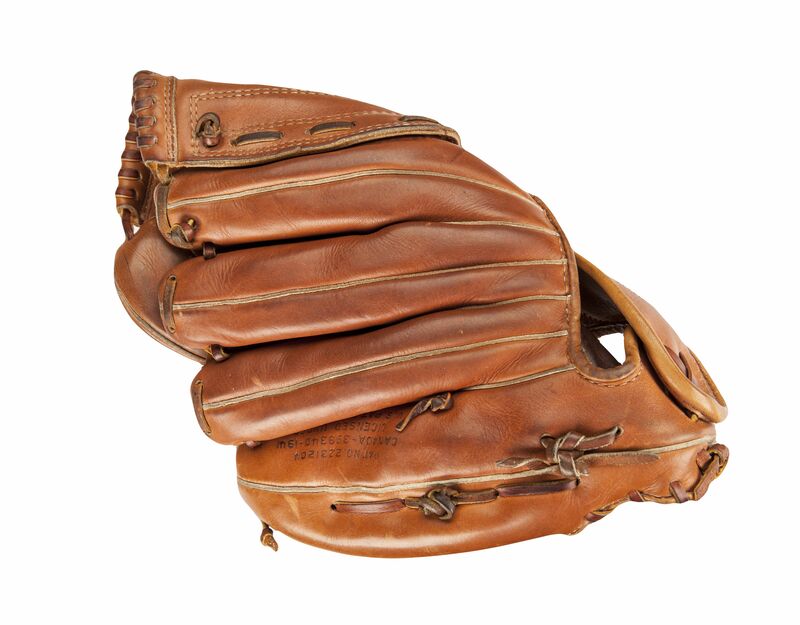 This glove has as solid provenance as you can get - it comes initially from John Donovan, an arrangement that was worked out with Ted Williams and our consignor. Donovan ,in his career worked his way up in the Red Sox organization from a 14 year-old bat boy in 1946 all the way to Red Sox Counsel and Vice President. 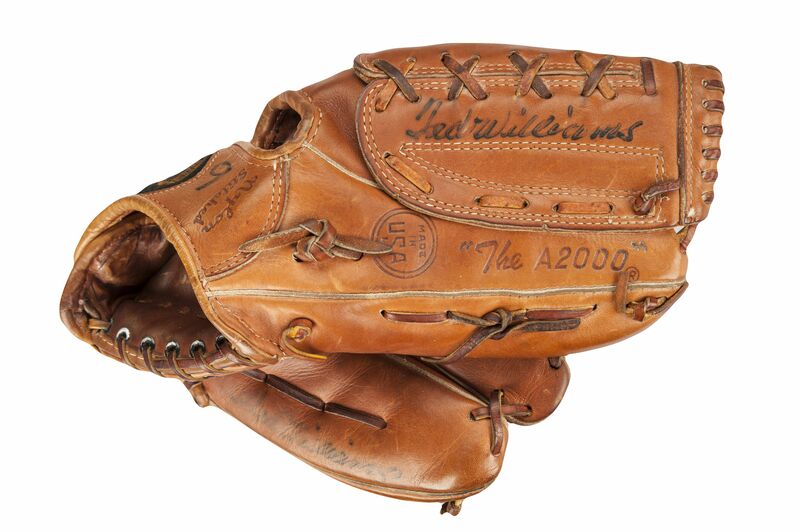 This one-of-a-kind glove was given to Donovan by Ted Williams upon his retirement in 1960. It was given to a mutual friend of Ted's and John's shortly thereafter as arranged by Ted , Donavan and the consignor, and has remained in the family possession for over 50 years. 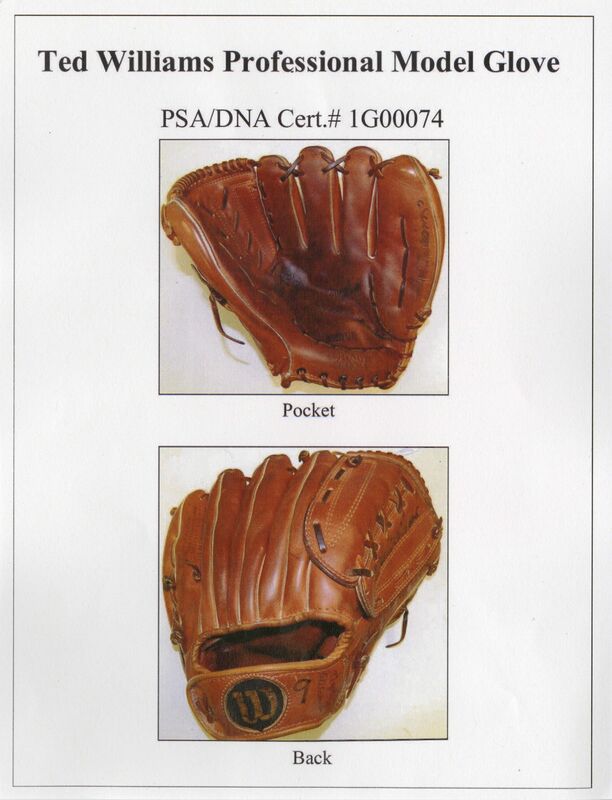 It is one of the very last gloves the baseball great ever used as a player and the only one ever authenticated by PSA/DNA. 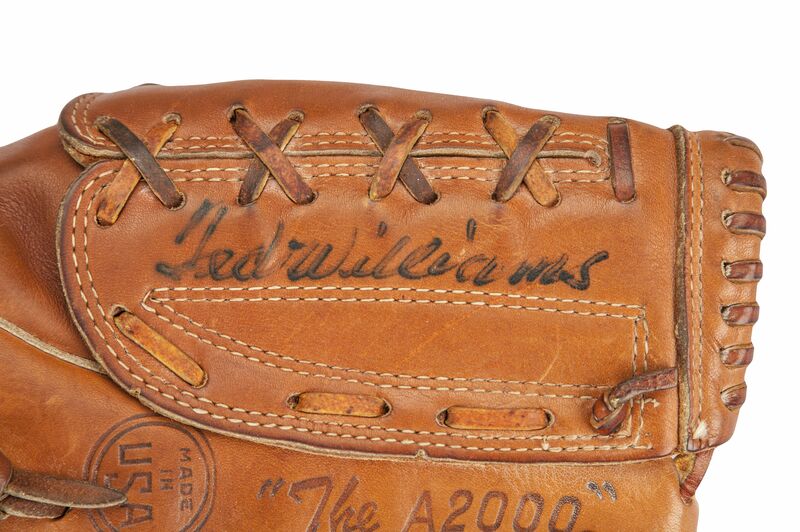 As the only PSA/DNA authenticated Ted Williams glove in existence, this piece of history has been photographed and featured in numerous books and articles on Ted's storied career. 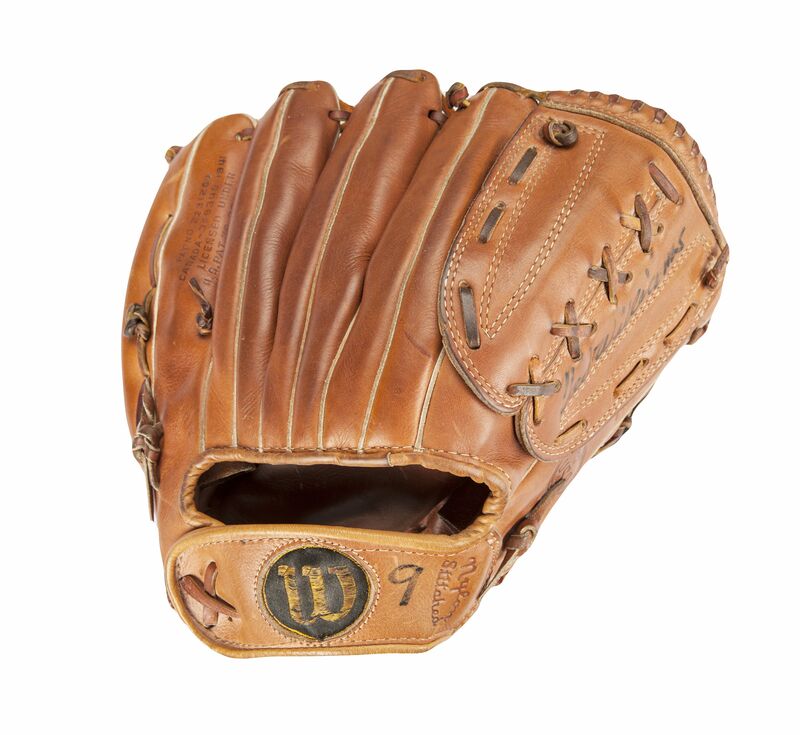 Glove expert Denny Eskin went so far as to call it "The finest Ted Williams glove in existence" - looking at this piece of history we dare anyone to differ. From the condition, presence and provenance, it isn't hard not to close your eyes, take a deep breath and envision Ted Williams at The Wall, popping his hand in it, waiting for the ball. Letter of Authenticity from PSA/DNA (1G00074). Letter of provenance from original owner who has had the glove in his possession since receiving it from Ted Williams c/o John Donovan will also be included. This description has been edited from the printed catalog version.